I’ve been told by many farmer wives that you can’t predict the season, so you might as well give up trying. And to be honest, that’s completely fair. This is our 5th year of farming and once again, this harvest season is completely different from the last. If you don’t live in a farming community, you probably don’t know that this harvest is very, very late. At least, it is in Illinois. Usually they’re wrapping things up around Halloween. This year, we’re predicting that they’ll be done mid-December. In the past, I’ve had a hard enough time telling people, “I can’t make any rock solid plans in the fall.” Now, I’ve got to tack the beginning of winter on to that as well. And it’s not like I can do anything I want without Thomas, because this year I’ve got Ginny, and there’s only so much I can do without his help. This particular harvest season does bring it’s fair share of good, however. This weather is beautiful. 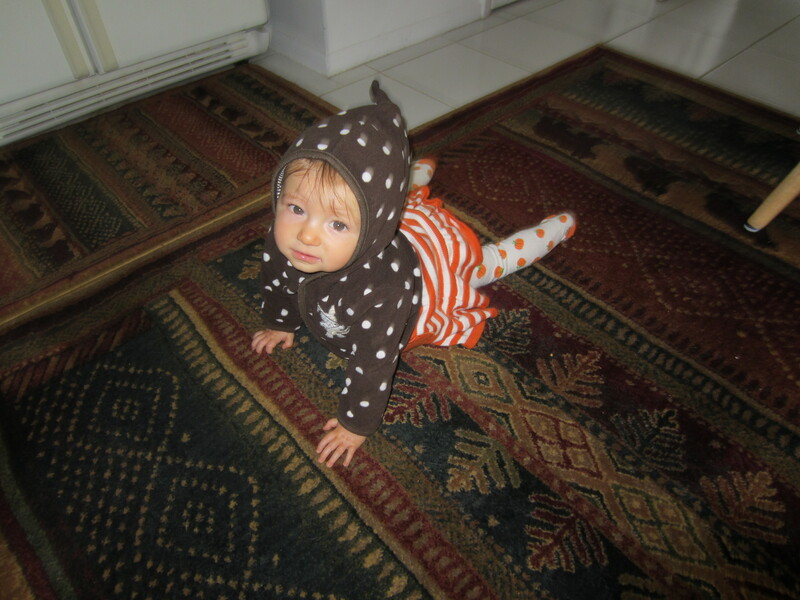 Ginny is actually crawling now (not just scooting with her head/torso like an inch worm). I love the fall baby clothes! The colors are adorable. And, to help with the ever continuous struggle to lose this baby weight, warm drinks are now extra enjoyable, and can be really low calories if you play your cards right. I just found sugar free pumpkin spice and sugar free peppermint mocha creamers by Coffee-mate! 1 Tbsp is only 15 calories. These creamers aren’t in the little, rinky-dink containers…they’re sold in 32 fl-oz bottles. A couple of years ago, Coffee-mate finally offered sugar free peppermint mocha, but only in the small size. I can’t tell you how many I went through…suffice to say, a lot. Back then, their sugar free options were made with aspartame (I say that like it was so long ago…but really, I think Coffee-mate is listening to their consumers, ie, me). Now, they’re made with sucralose (brand name Splenda). Another rather strange positive about this warm autumn is the benefit it has given to my experiment with sweet potatoes. I did some reading up on growing sweet potatoes from slips (those roots that start growing out of your potatoes when they’ve been sitting in your pantry for too long). I did this way too late in the summer, and didn’t get them planted in time. But because it’s been so warm, they’re actually growing in my garden. I don’t expect much of a yield, but I wanted to learn how to do this so that next year I can grow a real crop. But because of this weird weather, I might get a little more than I bargained for, as long as I dig these up before the first real frost. We’ll see, and I’ll keep you posted.